Chicago’s first protected bike lane on Kinzie St. increased ridership by 55 percent without increasing traffic congestion for cars. Active Trans’ Kids on Wheels mobile bike fleets once again traveled the region this summer to provide on-bike education opportunities for youth. Since 2013, these two 25-foot cargo trailers have trekked hundreds of miles and served thousands of kids in dozens of communities, offering the opportunity for students to learn valuable riding skills and techniques. It’s an especially important resource for communities where kids and families may not be able to afford to own a bike of their own. 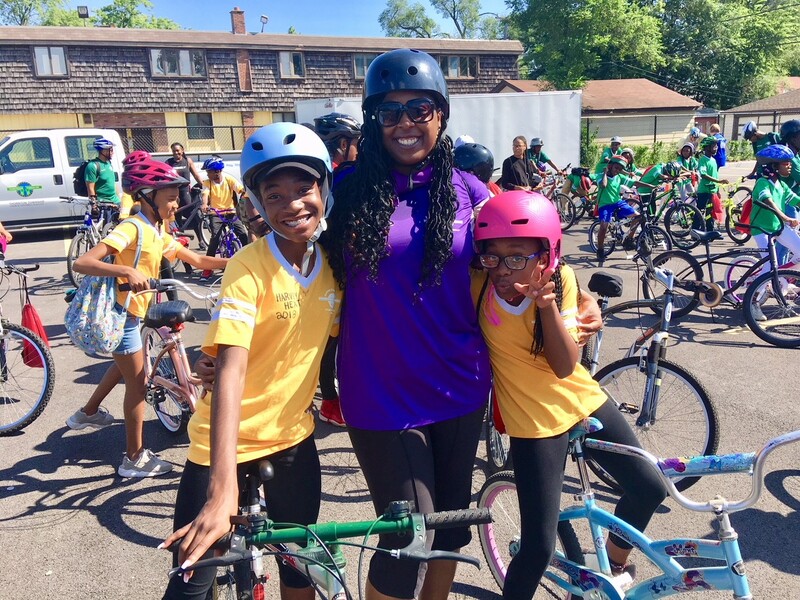 This season, Active Trans worked with partner organizations to bring the Kids on Wheels caravan to communities from the northern suburbs to the Southland, in addition to City of Chicago neighborhoods. The season kicked off in May, with Northbrook School District 28 borrowing a fleet for its traditional year-end bike rodeo events at Greenbrier, Meadowbrook and Westmoor schools. More than 500 students participated in this district-wide bike safety education unit. July saw a fleet support a community bike ride for all ages in Thornton Township. The Township government hosted this fun activity to build community spirit and promote physical activity. Next up, Active Trans worked with Divvy Bikes, Slow Roll Chicago, Chicago Public Schools and BUILD Chicago to provide bikes for a variety of events in Chicago, including a community bike ride and several skills-building sessions for adults and youth. Active Trans also helped arrange for League of American Bicyclists cycling instructors and super-advocates Elizabeth Adamczyk of the Chicago Ride of Silence and Dave Simmons of the Friends of Cycling Elk Grove to provide top-notch training for two of the events. Where will the Kids on Wheels Trailer show up next? If you are interested in having the Kids on Wheels Trailer make an appearance at your community’s on-bike event for youth, please email education@activetrans.org for more information.